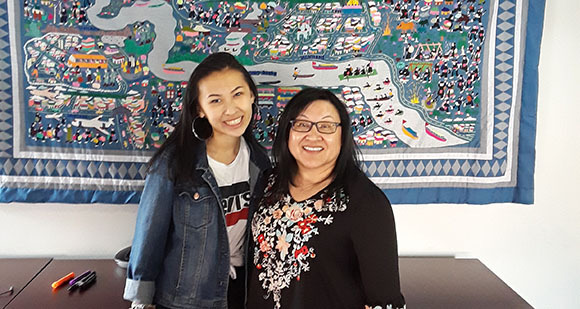 La Khang Yang and her daughter Tiffany stand in-front of a Hmong history quilt in the CNNC conference room. La Khang Yang was a former AmeriCorps Member and program staff, and the first Hmong person to attend UNCG. Tiffany will attend UNCG this fall as a first year student. The Center for New North Carolinians had a special visitor in March, La Khang Yang, the first AmeriCorps ACCESS Administrative Assistant. La helped to launch the ACCESS Project in the mid 1990’s, working part-time while she also worked on a social work degree. She was also the first Hmong student at UNCG and graduated in 2000. La also served one year as an AmeriCorps member at Lutheran Family Services. Now La lives in Conover, North Carolina with her husband and children. She was at UNCG last month to take her daughter Tiffany on a tour. Tiffany has been accepted at UNCG and will become a UNCG student in the fall. The Hmong people are the largest group of refugees to come to the US as a result of the Vietnam War. Living in the mountains of Laos, the Hmong were recruited in great numbers by the CIA to fight America’s secret war in Laos because Congress had not given authorization for the US to go to war with Laos. The North Vietnamese and Pathet Lao (Communist Laotians) traveled along the mountains of Laos, the so-called Ho Chi Minh trail, to maintain supply lines for the North Vietnamese soldiers going into South Vietnam. The Hmong, and to a lesser degree, some other hill-tribe people, served as contracted US soldiers. When Vietnam and Laos fell to the North Vietnamese led forces in 1975, the Hmong and their families who worked on behalf of the US government fled in great numbers, crossing the Mekong River into Thailand where they were put into several large refugee camps along the border. Many were then resettled as refugees in the US beginning in the late 1970’s. When the Hmong came to the US, the government resettled many of them in the Central Valley of California, thinking they would become farm workers for the large corporate farms there. However, the Hmong are quite independent and most were not willing to serve as farmworkers in the corporate agricultural system. Large numbers were also resettled in Minnesota and Wisconsin where church-related resettlement agencies were particularly moved by their history of exploitation by the United States. California, followed by Minnesota and Wisconsin, were the three largest Hmong resettlement states. Few were initially resettled in North Carolina. However, in the early eighties, a clan leader, Kue Chaw, unhappy with the resettlement of his extended family in a northern urban area, set off on a quest to find a better place for his people. He drove into Marion, North Carolina, and the mountains reminded him of his home in Laos. Kue Chaw took the initiative to move his large extended family to the area. They found land to farm and found factory jobs. Others followed into the Western Piedmont and adjacent Appalachian area of North Carolina. North Carolina became the fourth largest Hmong resettlement state, most coming as secondary migrants from other states. By the early part of this century, Hmong leaders estimated close to 300,000 Hmong have made the US their home, covering three generations, and close to 15,000 of them living in North Carolina. La Khang was the first Hmong student to graduate from UNCG. Soon thereafter, another Hmong person, Touger Vang, came to UNCG as a staff member and graduate student. Touger established a Hmong Student Association, and Hmong families decided that UNCG was a safe and welcome place for their children who were college bound. Over the next few years, UNCG graduated more Hmong students than any other institution of higher education in North Carolina. We are excited to welcome La’s daughter Tiffany to UNCG this fall.